Is bullet dodge always auto scrap? Thanks for the previous help I have been given folks! I was gifted this legendary hunter in a 15 call, and am torn. I already have two pink star hunters with the same traits as Naomi (who herself is not a pink star because there is such a thing as overkill). I want a hunter with ruthless, and am kind of tempted to give this one a whirl, for occasional situations with freemen, not as a main player. Is bullet dodge always a ticket out the door? Or am I better with the tokens? I really love that hunter and love b dodge. So i should keep him. Given the very few maps that bullet dodge is useful for, and the low percentages that it works at, it's an autoscrap for me. Frank is off to a good start, especially if he got marksman. 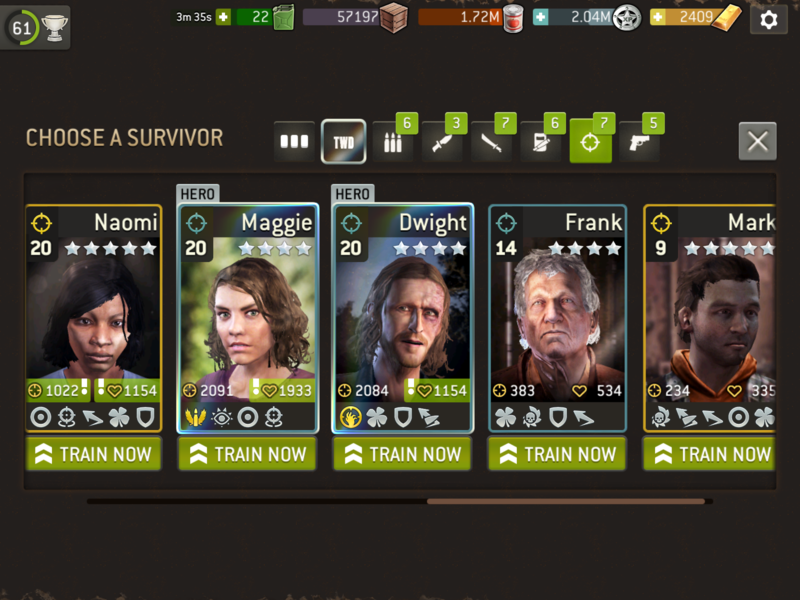 Naomi is the old perfect, which still gets you pretty far, though ruthless is becoming an almost necessary trait for most classes to justify putting tokens into a survivor. I'd take the tokens from Mark, no question. 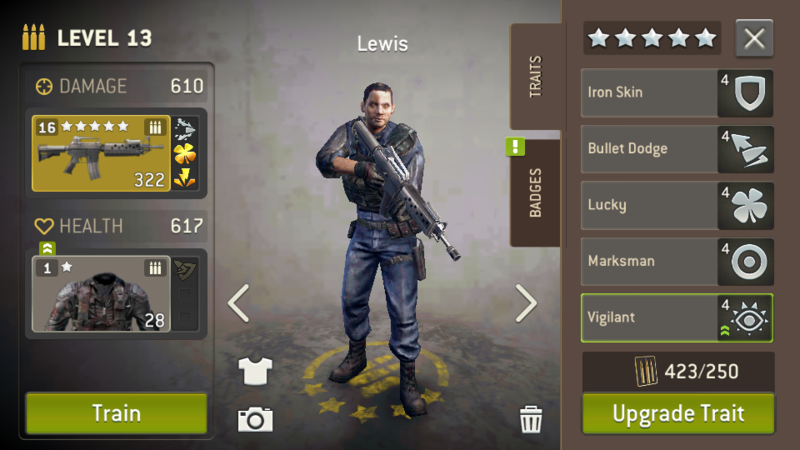 My favorite traits are sure shot, iron skin and marksman. Naomi has all three. I would be instantly scrapping Mark for the tokens. Lets hope Frank has a better 5th trait. Yeah, I'd scrap Mark and put those tokens towards Frank. Hope he gets Sure Shot and then load him up with three % damage badges. I suspect most players on the forum will say yes, but I think a lot of it comes down to how much you play Outpost and how much room you have in your roster for variety. Some of my favorite survivors have Bullet Dodge, but a lot of that is a result of me playing primarily Outpost and absolutely avoiding the Challenge until it was revamped into it's current form. By the time I moved to Challenge play, I wasn't willing to rebuild my entire roster from scratch. Still, it works often enough that I don't mind having it here and there. And frankly, if I had kept waiting for perfect traits in every class, I would still be waiting, since some of my ideal combos seem really difficult to find together. I would scrap Mark cause he wont add much to ya roster and im pretty sure you will not equip him with best badges and wont make primary hunter. gamble on frank. ideal would be marksman, followed by sure shot. I keep Bullet Dodge, Dodge, and stun avoidance for my Outpost guards. Having no functional badges makes it hard enough to defend, so those pieces help... sometimes. I use Dwight & 2 shooter, both with bullet dodge, most of the time against Freemen. I actually do not have any hunters with bullet dodge. Bullet dodge is not a automatic scrap for me. I also have gold bullet dodge on the gear for my shooters, helps decrease the amount of damage your survivor takes if they are hit. I also have a assault with bullet dodge I like using when I do outpost raids, I typically pair her with a shooter & a melee survivor, all have bullet dodge & I try to have their gear with it also. I know many players in my guild family with trash any survivor with bullet dodge.I think alot of it is personal preference & playing style.